Former Attorney General and Justice Minister Jody Wilson-Raybould is in the spotlight again today with her shocking testimony to the Justice Committee, stating that she was subject to “extraordinary pressure” from multiple individuals in the Prime Minister’s Office to intervene in the SNC Lavalin case – after after she made it clear she would not do so. The way first-past-the-post concentrates all the power with one party sets the stage for such scandals – and makes it much harder for the public to get answers. More on first-past-the-post and power of the PMO here. 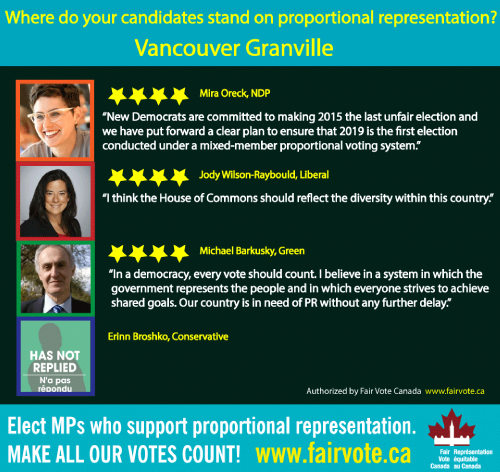 What many Canadians may not know is that in 2015, Jody Wilson-Raybould clearly and strongly supported proportional representation. During the 2015 election, Fair Vote Canada approached every candidate with a questionnaire, assessing their level of support for proportional representation. Responses from Liberal candidates in winnable ridings for the Liberals were rare. With few notable exceptions, most Liberal candidates did not respond to us, or declined to answer any of the questions, sending only a party-issued form letter in the place of anything that would hint at a personal position or commitment. She retweeted our poster promoting the candidate positions. All of this went well beyond what most Liberal candidates were willing to do. In May, 2017, Wilson-Raybould stood with the Liberal Party in voting not to concur with the report of the Electoral Reform Committee (159 Liberals voted no, 2 voted yes). This vote was a last ditch effort by the NDP to get a discussion of electoral reform back on the table — after Justin Trudeau had slammed the door — by asking Parliament to endorse the ERRE report. In all fairness, some Liberals who did personally support PR were no doubt whipped to vote no — and Wilson Raybould especially would have been expected to show cabinet solidarity. In addition, the ERRE majority report supported by the NDP, Greens, Conservatives and Bloc had recommended a referendum, a last minute concession to the federal Conservatives (the only party to demand one). As most experts who testified to the ERRE agreed, a referendum builds in a significant advantage for the status quo and is an extremely poor tool for deliberating and making a decision on a nuanced issue. With no truth in advertising legislation in Canada, a referendum can easily dissolve into fear-based misinformation campaigns motivated by partisan power struggles, distracting voters from the basic issue of equality. While Wilson-Raybould’s current opinion on proportional representation is unknown since she has not spoken of it since she was elected, her history suggests an individual with strong and consistent values. I don’t apologize for being vocal with my opinions. That doesn’t mean to say that I don’t value other people’s opinions because for the entirety of my professional career and how I was raised, in terms of consensus based decision making, it is incredibly important to take in the views of other people. That’s how we make good public policy in this country. Part of what I want to reflect on tonight is how after three years as a Minister of the Crown I still have to contend—both personally and professionally—with a colonial legacy that remains pervasive despite best intentions and which is exacerbated by the trials and tribulations of partisan politics. …Words, in the work of reconciliation, are also cheap without real action—action that goes to the core of undoing the colonial laws, policies and practices, and that is based on the real meaning of reconciliation. We all need to understand this. …The path of justice and equality is not advanced or achieved through half-measures, good intentions, or lofty rhetoric. And it is certainly not achieved through obfuscation or confusion about what we mean when we speak. Hard choices, innovative actions, transformations in laws and policies, new understandings and attitudes, new patterns of behaviour—this is what is needed. The SNC Lavalin scandal underscores again that first-past-the-post has failed to deliver “new patterns of behaviour”, much less “transformative change”. Concentration of power does the opposite. Canadians can hope that the next time a real chance for proportional representation presents itself, Wilson-Raybould will find her voice.